India or China: Has Nepal A Realistic Choice? I was crossing the airstrip to a small aircraft that would take me to Nepal’s interior. We had left the disarray of the departure hall in Kathmandu airport with its melee of early morning hopefuls anxious to escape the polluted city and fly to a trailhead in search of fresh mountain streams and clean air. Planes are in short supply here and cancellations of domestic flights are common. Although those waiting foreigners seemed remarkably patient with the delays, perhaps attributing the disorder to high altitude. Politics wouldn’t figure into any charming anecdote sent from their holidays in the Himalayas. Neither was I thinking about Nepal’s political troubles at that moment. Not until my colleague directed my attention to a medium sized plane parked on the edge of the tarmac. “That Turbo Prop M16 is Chinese-made; it was bought by Nepal. Another of the same model, a gift, is expected: two-for-the-price-of-one, you can say.” Nepal could use more aircraft, with not infrequent crashes and regular over-bookings on domestic flights. As for the undelivered Chinese turbo prop, “It’s being held up”, my companion replied. He exhibited the lighthearted cynicism that Nepalese now apply to all public announcements, especially when officials are involved. I recalled seeing a recent front page article where a minister announced that irregularities in the registration of a Chinese aircraft would delay its arrival. “Too much aid from China is not welcome.” Was this another case of India blocking Nepal’s economic exchanges with China? Maybe. Or maybe Boeing, American. Or Airbus. Europeans and Americans may be unhappy with China’s overtures in Nepal. India too; Delhi influences everything that happens here. India and Nepal are bound together in a myriad of ways with India being the overwhelmingly dominant partner. Nepalese were painfully reminded of this when India supported a severe and sustained economic blockade on its land-locked northern neighbor. With Nepal’s dependence on India for heating fuel and petrol for transport— two of many essential commodities ranging from paper and wood to rice and fruit, also manufactured items and packaged/processed food and beverages—life across much of Nepal came to a halt. It was the heating gas and transport fuel embargo that caused unprecedented hardships in population centers, especially the capital. It left people embittered and reassessing their relation with India. The boycott was launched by the Mahdesi people, unhappy at what they considered marginalization, when last July after years of delays, Nepal’s new constitution was signed. 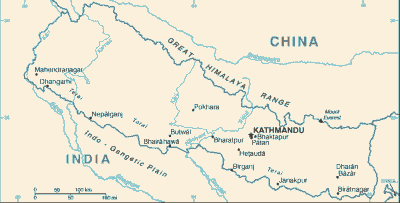 Mahdesi-Nepalese, inhabiting a wide belt of land along their shared border, maintain close ties with India. They decided to utilize this strategic position to express their discontent with the constitution and press for better representation; thus the blockade of goods (from India) entering Nepal through their region. That internal Nepal crisis took on greater significance when the Indian government was seen as reinforcing Mahdesi demands. Indeed India instructed Nepal to amend its constitution in line with Mahdesi requests. Nepal’s leaders were neither able to secure India’s co-operation nor to negotiate a solution with the steadfast Mahdesi. As the blockade wore on (lasting for seven months, including winter, although it began to ease somewhat earlier) Nepalese began to seek an alternative. Not easy, since its northern border cuts through the almost impenetrable Himalayan mountain range. Tibet to the north is vast and undeveloped but is nevertheless Nepal’s best access to China. It would be years before a viable route through there could bring essentials like fuel on the scale needed. Although during the blockade China began sending limited supplies to its stricken neighbor. Even with end of the blockade, anti-Indian sentiment in Nepal remains high. Over my many decades observing Nepal at close hand, I’d not seen Nepalese so angry and disappointed with their neighbor, a place where many of them have studied and where they seek medical treatment, with a culture close to their own, the source of their evening television entertainment. Those millions of children who experienced hardships created by the blockade may well remember that injury for years to come. Enter China: ties between it and Nepal have moved far beyond a few specialized items produced in Tibet. Today Chinese travelers are a common sight in the capital and on trekking trails. Chinese retailers operate shops in the tourist quarter of Thamel, selling curios and garments and managing hotels and restaurants. Chinese-made household items, electrical goods (in competition with Indian manufactured goods) are for sale across Nepal. China also provides significant development aid to Nepal. An indication of envisioned future growth is the offering of classes in Mandarin at least one major Kathmandu language institute (www.ulci.com.np). The Madhesi embargo was started before earthquake relief ended and long before collapsed homes and schools could be rebuilt, also just as winter was approaching. In Nepal’s desperate search for fuel at that time, China became to the fore. It would not be a simple solution since the quantities needed could only be provided by road through Tibet and across Himalayan passes. Supplies might be insufficient but the concept of expanding routes from the north was pursued. (By October, at the height of the blockade Nepal and China signed two treaties, one on trade and a second on fuel supplies). A viable rail link or a pipeline into Nepal from the north seems implausible; in the recent crisis the China option was of limited benefit. Yet China’s reputation in infrastructure engineering is legend; having achieved a rail route across China into Tibet, an extension through the Himalayas, however fantastic, is possible. Indeed a month ago, China dispatched what appears to be a symbolic train delivery to Nepal . The international shipment departed from Lanzhou westward covering 2,431 kilometers of rail from to Shigatse (Tibet), then 564 kilometers by road from Shigatse to Kyirong (on Nepal’s border) and the final 160 kilometers by road to Kathmandu. Accompanying this news there’s talk of a tunnel through the Himalayan range from China into Nepal. Given what Chinese engineers have accomplished elsewhere, such a route is not unattainable. What eventually happens depends more on Nepali politics, and China and India’s determination not to jeopardize their own growing co-operation. Internally Nepal’s leadership is weak and unstable, subject to factionalism and corruption. Leaders from across the political spectrum lack negotiating power, political support, and any vision to follow through with a substantive long-term Chinese policy. On its side, it’s doubtful if China would jeopardize a stable relationship with India to change the status quo in Nepal. Meanwhile India and Nepal are reportedly finalizing plans for an oil pipeline from the south.